2) Are YOU making a difference (in your life and lives of those you love and serve)? 3) Do YOU want YOUR business to be big or small or somewhere in-between? This quote has been rolling around in my mind for the past couple of weeks. I believe that it’s an important consideration. How about you? No matter what you want in life, you can achieve it and sometimes going smaller will give you even better rewards. Since I’ve declared that it’s officially The Collaboration Economy where people are the TRUE currency, I’m looking closely at all of my business and personal affiliations. I plan to make some small shifts that will make a big impact. AND the beauty of all of this is, YOU can choose to do the same or you can choose to make big changes to create subtle shifts. The choice is yours and your choices should always support what is best for you internally. No shame. No blame. No guilt. YOU get to make up the rules of your own life. One thing that I know for sure is that we are officially in The Collaboration Economy where people are the TRUE currency. I am happy to see this shift and was impressed with this recent news clip from CNN Money with Gravity Payments CEO Dan Price. THIS demonstrates The Collaboration Economy in action. Watch the CNN clip here. I’d love to hear your thoughts about The Collaboration Economy and what you have planned for your future. Click here to access the full blog post about these philosophies. Join the conversation by leaving a reply below and let me know what you think? This entry was posted in Manyon's Musings, Marketing Strategy	on Monday	September 8, 2016 at 6:22 pm. You can follow any responses to this entry through the RSS2.0 feed. You can also leave a response. Collaboration is something that I have always enjoyed in my business. To me it’s the truth that the sum is greater than the individual parts. I’ve been working for over 6 months now doing a weekly Google HOA with Marnie Pehrson, it’s a collaboration that has worked well for us. How do you feel about the greater impact of collaboration as demonstrated by the CEO of Gravity Payments. I feel as though that is the truly THE Collaboration Economy in action. There’s something to be said for leveling the playing field and honoring people. That’s what I’m excited about. It’s very interesting Lisa to think more deeply about collaboration and human value. After touching base with you in the last week or two, and reading what you have to share, it’s clear that there are so many, many assumptions about progress to bust open..simply by getting out of the territorial mindset and work with each other. It’s always great to connect with you and learn about your perspectives. 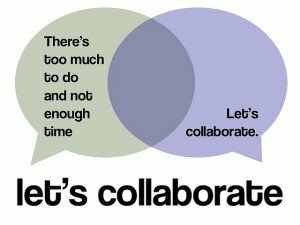 Yes, there is more than enough business to go around and collaboration, even within the same field, is so beneficial. I look forward to hearing more about your work as you can share. Hi Lisa, I definitely believe in collaboration. The quote about being small to be big reminds me of a quote about going slow to go fast. We have to be thoughtful about what we do and how what we do impacts our lives and business. You are spot on. Slowing down to determine what is most important is one of the most valuable things I’ve ever done. Love that it’s officially The Collaboration Economy. As I’m about to host my 3rd Anxiety Summit (it starts May 6 http://www.theanxietysummit.com) I most definately value collaboration – with my speakers, my affiliates and my sponsors! It could not happen without collaboration and without them! I love how you’ve continued to grow this summit year after year. The information that you and your guests provide is truly valuable. Your statements are true and the questions should be answered. I would suggest a fourth item in two parts – How much money do you need to make? Want to make? This may define the size of the business question over time. That can be true and at the same time, small businesses can out-earn larger businesses in may ways especially with lower overhead. I love connecting people with other people and resources that support them! Even if I don’t have a specific project in mind for collaboration, the sense of community is energizing and inspiring.